They say everyone should own an Alfa but I think everyone should own a Rotary, and a motorbike, just so you know what they're like. Having owned an RX2, two Series One RX7's, a Series 6 RX7, and having put a 13B into a Datsun 1600SSS, I think I've done my time but they have left a lasting impression on me. Huge amounts of power from a motor the size of a 4 Gallon drum. Leaving them natural aspirated though is always interesting because with Rotaries noise generally equals power. The Capella above is a great example of a four door and you can see more photo's of it here. The RX2 was an option and most were badged Capella with a small RE badge. My one was an ex club car and had twin front sway bars, fantastic suspension, twin dizzy 12A and twin exhaust system. Driving it from Auckland to Blenheim was an amazing experience. Cruising down the Desert Road with a BMW and a Commodore we never dipped below 160km/h. Fantastic but I wouldn't advise that nowadays. One day in 1971 my mother drove her Vauxhall Viva into town to trade it in on a new one. After school, I arrived home to see a spanking new 1971 Mazda Capella RE parked in the driveway. It was the very first demo one in Hawkes Bay and looked similar to the one above except in had rectangular headlights. It was a light primrose yellow colour with dark tinted glass. It had standard features unheard of at the Viva dealership. Electric radio aerial, reclining black seats with headrests, a tacho, heated rear screen and lots of things that beeped, buzzed and blinked. For two weeks, members of my family 'tested' the car's top speed on a straight road behind Bridge Pa regularly reaching speeds around 120 mph - it was simply amazing. I learned to drive properly in this car and to this day love rotary engines. The Capella RE was one of the quickest cars around at the time - a match for the 3 litre Capri, VH Charger or GTR Torana. Years later I bought one as a hack-about in Sydney and can still boast one of the quickest times ever from Sydney to Canberra being passed only once by a GT Falcon towing a boat at 100 mph (you'd slow down too). 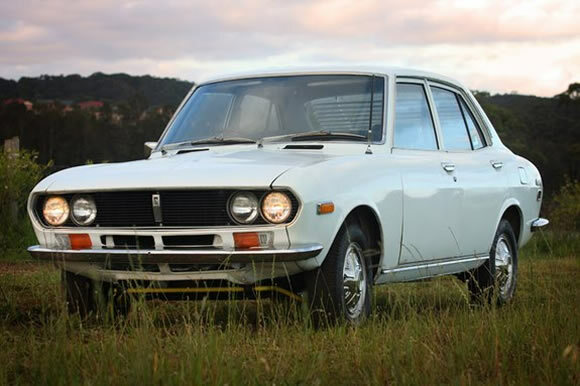 The Mazda Capella RE is still one of my favourite cars. Now thats a day I would remember too. Excellent story Rob. And I would have slowed down too. 100mph with a boat?! Madness.